On September 19, 2012, NASA scientists assigned Mars rover Curiosity a monumental task — determine the properties of a football-sized pyramid-shaped rock that looks like the Great Pyramid of Giza. Strange thing is… the rock is in the middle of nowhere! Where did it originate? Could it have been built by an intelligent race that lived or still lives on Mars? Curiosity discovered this rock at the end of its 43rd Martian day. Using the 10 cm tall and 16 cm wide rock as a practice target, Curiosity will test its contact instruments: Alpha Particle X-Ray Spectrometer for reading a target’s elemental composition and Mars Hand Lens Imager for close-up imaging. While weird rocks shaped by wind erosion are not uncommon on Mars’ surface, this minature pyramid is probably just a rock. Spurring the imaginations of Earthlings imagining life beyond, the odd rock remains the center of speculation, especially since Curiosity’s objective is to find evidence of Mars’ capability to harbor life. Named after NASA engineer Jake Matijevic who passed away on August 20, 2012, the pyramid-shaped rock may be a impact fragment ejected into the Gale Crater. Jake Matijevic was the leading engineer in the Sojounrer, Opportunity, and Spirit missions, while surface operations systems chief engineer for the Mars Science Laboratory/ Curiosity mission. 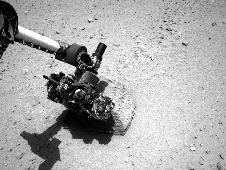 On September 22, 2012, Curiosity finished its inspection of the rock target. Its ChemCam lasers zapped the rock to analyze its chemical components and calibrate the instruments, marking the first use of Curiosity’s robotic arm. Dicker, Ron. “Mars Rock: Curiosity Rover To Examine Pyramid-Shaped Boulder, NASA Says.” Huffington Post. Huffington Post, 23 Sep 2012. Web. 1 Oct 2012. Greicius , Tony, ed. “Curiosity Finishes Close Inspection of Rock Target.” NASA. NASA, 24 Sep 2012. Web. 1 Oct 2012. Greicius , Tony, ed. “NASA Mars Rover Targets Unusual Rock on Its Journey.” NASA. NASA, 19 Sep 2012. Web. 1 Oct 2012. In 1995, the first brown dwarf, Teide 1 of the Pleiades cluster (M8 star), was discovered by the Spanish Observatory of Roque de los Muchachos and verified. Most brown dwarfs belong to spectral types L and T, which contain cooler stars than spectral type M. So far, more than 1,000 brown dwarfs have been discovered.